A United Nations spokeswoman in the provincial capital, Goma, Sylvie Van Den Wildenberg expressed concern over the renewed violence. Reuters news agency quoted the Congolese army as saying it killed 28 fighters loyal to former General Laurent Nkunda, but the claim could not be verified. Government troops launched the assault on Nkunda's forces late Sunday in Nord-Kivu province and the fighting ended early Monday. On Sunday, Congolese Defense Minister Chikez Diemu said the government was trying to stabilize the situation through negotiations rather than the use of force. But Nkunda told VOA the rebels felt as though the government had stopped the peace process and had chosen war instead. 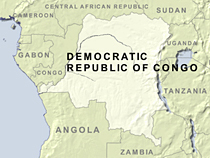 Congo's army has been fighting Nkunda's forces for several years as part of efforts to gain control over eastern Congo. That fighting flared up in North Kivu last week, leading to an appeal for calm by the United Nations peacekeeping mission in the country.